A revamped theatre in Canterbury will be a "world-class" building that improves the skyline of the cathedral city, the architect has said. 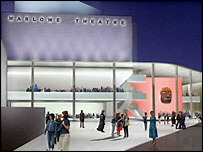 City councillors chose Keith Williams to design the new Marlowe Theatre saying his designs were both "stunning" and "breathtaking". Part of the theatre will be demolished in order to replace it with a state-of-the-art facility. The theatre is housed in a 1920s cinema but only its shell will remain. The architect's submission to the council said he aimed to deliver "a multi award-winning, world class, contemporary building that improves the architectural quality and skyline of the city". Mr Williams told BBC South East: "There will be something that isn't there now which is a new second theatre. It will be a smaller space - it will be flexible and multi-functional." Mr Williams has designed buildings across Europe including the Wexford Festival Opera House, the Unicorn Theatre for Children in London, and the Birmingham Repertory Theatre, the council said. Council Leader Harry Cragg said the council was delighted to be working with "such a high-calibre, innovative architect".